_ _ I’ve always been an obnoxious stickler for grammar, spelling and pronunciation. Even in text messages I refuse to accept the replacement of “your” for “you’re”… they’re not the same word, dagnabbit! My first two years of college were spent wandering aimlessly from class to class, as I remained an Undeclared major. I should have known that I was meant to study English– I’ve always had an undeserved sense of superiority, dating back to my days in preschool. One of my clearest memories from the pre-K classroom is severely reprimanding my friend Tina for continuing to pronounce the word “yellow” as “lellow.” What a pleaseant child I must have been. 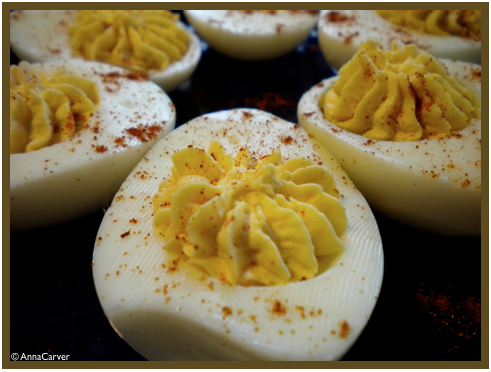 _ _ These deviled eggs are not your typical mayo-filled kind. After taking an entire BBQ chicken salad-pizza and pumpkin sheet cake to the face, I decided to try some healthier food for the next couple days, and thus these babies were born. The “lellows” are mixed with roasted red pepper hummus and light sour cream– so eat up, and revel in the sense of well-being that eating healthy and knowing how to properly contract words gives you! *Note part deux: You can add more to the yolk mixture if you’d like, such as cayenne or chives! Both would be delicious. 1. Bring a large pot of water to a boil. When it’s at a rolling boil, gently drop the eggs in (making sure not to crack them) and cook for about 10 minutes. 2. Remove the eggs from the boiling water and put them in a bowl in the fridge until they are cool enough to handle, about 20 minutes. 3. Remove the egg shells and slice them in half. Scrape out the yolks and put them in a food processor along with the hummus, sour cream and whatever else you choose to add. Puree the yolk mixture until it has a smooth consistency. If it seems too dry for your liking, add another teaspoon or 2 of sour cream. 4. Pipe the yolk mixture back into the egg whites, sprinkle with paprika and enjoy!